It's been a long time since I made my little mohair bears. I had a few left over from the last time I made them (2003) and when the owner of our new fabric shop asked me to bring in a few things to sell, I brought them down. The first set sold within a few hours. I quickly got to work making more. 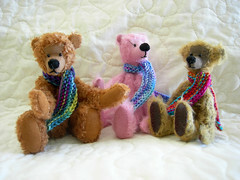 These three are part of the new batch of bears. 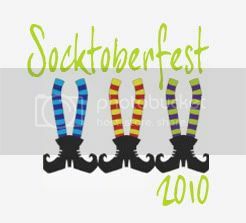 I used to tie pretty ribbons around their necks to give them a bit of personality, but I've learned to knit and now they all get little scarves made from my leftover sock yarn. I've been a one-woman bear factory for the last couple of weeks, working on my new bear design. I'll post a photo of the new bears in a day or two.